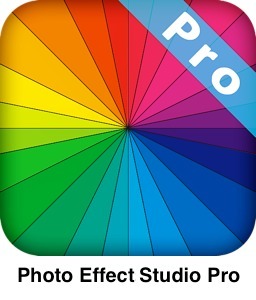 Photo Effect Studio Pro is a digital photography application specializing specifically in altering your photographs. It’s not a replacement or a competitor for Adobe’s Photoshop or Pixelmator but it does offer some very compelling options to be a very good companion to both these applications. 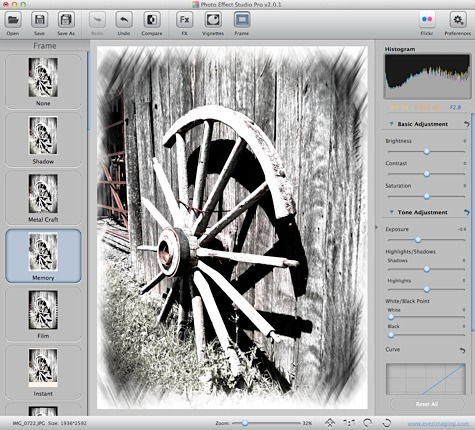 Many times users may not need the complete feature set available with higher end applications, and with that in mind Photo Effect Studio Pro fills the void. If your needs are to add effects, vignettes, frames, and adjust the clarity of the photograph through a series of level adjustments then this application will work for you. It is easy to use, easy to learn, and offers non-destructive editing. Photo Effect Studio Pro supports a wide range of over 100 RAW formats including: CRW, RAW, CR2, RAF, NEF, DNG, and RW2 along with the common compressed formats TIFF, JPEG, PNG, and BMP. 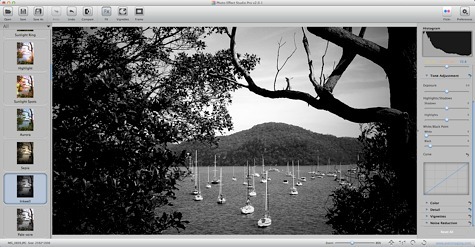 The application also supports photographs with resolutions up to 40 mega-pixels. The first thing you will notice when you load the application is its simplicity and pleasant user interface. 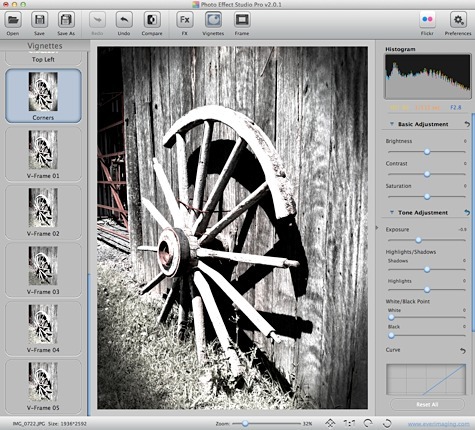 Digital photography applications have a tendency to be cluttered with a variety of tool palettes. The developer in this case has chosen to merge everything in a single window. With that in mind you may feel restrictive on smaller screens measuring less than 15 inches. The one downfall of having a single window is you are limited to having only one photograph displayed on screen at a time. Opening a second photograph will cause the application to request to save and close the existing photograph. On the right hand side of the window you have access to the histogram, tone, colour, detail, vignettes, and noise reduction adjustments. It’s very helpful to have these controls in order to increase or decrease desired changes. You will also be presented on the left hand side of the window with thumbnail images containing your photograph and the proposed alteration. In many cases you can immediately see if the effect will suit your photograph. When applying effects and adjustments you will be presented with changes in real time requiring no rendering, making trying different versions a breeze. One limitation is the inability to move the effect to a different location within the photograph. For example the fireworks option would present in the lower half of the photograph and there is no way to change the location to the skyline. This significantly limits which photographs can have the applied change without looking out of place. As a result you will not benefit from all the options available. When adding effects to an original photograph you can easily compare the result by pressing the Compare button located in the top tool bar. It would have been nice to see a side by side comparison in order to compare the differences. To take a look at vignettes I chose to change photographs as the one previous used was unable to showcase an accurate representation. With over 20 different vignette styles to choose from you can be confident in knowing that all your vignetting needs are covered. The final area specific to altering your photographs is the ability to add a frame. There are over 20 available and consist of basic shadow border frames to the fancy memory frame presented below. Upon being satisfied with your photograph it is then time to share it with family, friends, or associates. 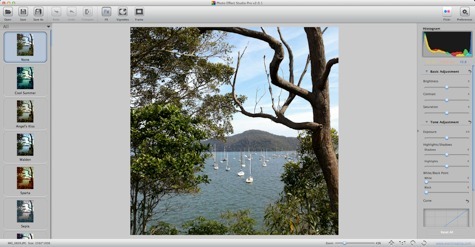 If you’re a Flickr user you will appreciate the inbuilt uploading ability to the service. You are able to set aspects such as the title, description, and tags. You can also assign a safety level and who the photograph should be visible to. 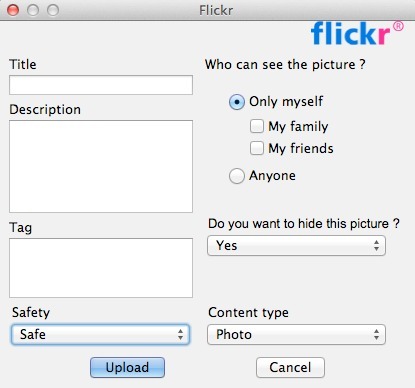 If Flickr is not your default choice you can simply save a copy of the photograph and upload to your desired service. Overall the app is solid and fast when applying real time changes. The realistic usage of some of the effects is questionable but there are still many useful features that users will appreciate. The major disappointment in this app was the inability to print directly from within the application. An application that allows users to create frames, vignettes, and special effects should always have the ability to print. Being restricted to a single photograph at a time and the inability to move the nucleus of an effect is also very limiting. Therefore, I am awarding this app a MyMac.com rating of 6 out of 10.